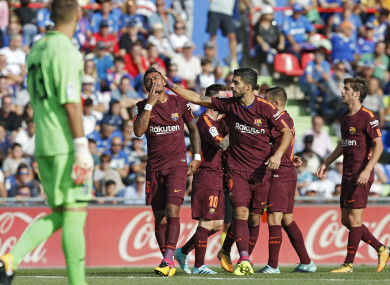 Barcelona's Paulinho, left, celebrates with teammate Luis Suarez after scoring against Getafe. PAULINHO SCORED HIS first Barcelona goal six minutes from time as the Catalan giants came from a goal down to win 2-1 at Getafe on Saturday and open up a seven-point lead over Real Madrid. Barca were dealt a double blow before half-time as record signing Ousmane Dembele limped off with a hamstring injury before Gaku Shibasaki’s sensational volley put Getafe in front. However, Barca’s responded thanks to their substitutes as both Denis Suarez and Paulinho came from the bench to turn the game around. Barca boss Ernesto Valverde made just one change from the side that swept aside Italian champions Juventus 3-0 on Tuesday with Sergi Roberto replacing Nelson Semedo at right-back. Yet, rather than building on the momentum of four straight wins, Barca looked sluggish as Getafe enjoyed the better of the early stages. The hosts should have gone in front when Gerard Pique nearly turned Shibasaki’s cross into his own net and Jorge Molina somehow only fired into the side-netting at the far post. Samuel Umtiti headed Barca’s best chance of the half straight at Vicente Guaita from Andres Iniesta’s cross. However, the visitors’ flow was further disrupted when Dembele limped off with a reported hamstring injury that could see him sidelined for the coming weeks. Barca had barely got 11 players back on the field as Gerard Deulofeu replaced the Frenchman, before they fell behind. Roberto’s headed clearance fell invitingly for Shibasaki to thunder an unstoppable dipping volley beyond Marc-Andre ter Stegen. Barca nearly responded before half-time as only a stunning finger-tip save from Guaita turned Lionel Messi’s dipping free-kick behind. Valverde was forced into another change at the start of the second period as Denis Suarez replaced Iniesta. And it was the substitute who inspired Barca’s revival as he collected Roberto’s cut-back from the right wing before bending the ball high past Guaita into the top corner. With Messi well-marshalled and Luis Suarez way off form for most of the second period, Getafe had chanes to grab a winner themselves. Ter Stegen was called into action twice in quick sucession to save from Alvaro Jimenez and Mauro Arambarri. However, the hosts were hit with a sucker punch when Paulinho burst onto Messi’s through ball and smashed across the despairing Guaita into the far corner. Email “Watch: Paulinho rescues Barca, €105 million summer signing lasts just 29 minutes on full league debut”. Feedback on “Watch: Paulinho rescues Barca, €105 million summer signing lasts just 29 minutes on full league debut”.